The Responsibility of Compliance Directors/Managers Is Increasing And It's Really Vital That They Have Their Finger On The Regulatory Pulse. 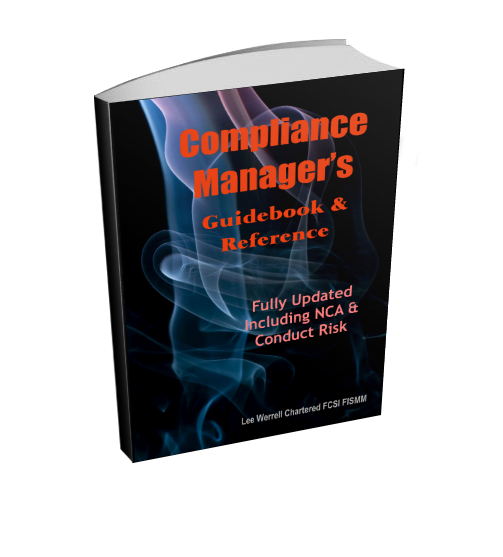 The “Compliance Manager Guidebook & Reference” is written for you. The number 1 guidebook on the foundations of methods to conduct a compliance role under UK regulatory requirements (FCA & PRA) for any firm in order to satisfy regulatory compliance. Being a effective and successful UK Financial Services Regulatory Compliance Director/Manager who wants to make sure they have all bases covered before any regulatory visit; or maybe wish to know the real key tips of compliance risk assessments and business or operational risks; or you are new in the job and want insights into hot-topics, enforcement and regulatory methodologies and best practice. Then the “Compliance Manager Guidebook & Reference” is written for you.